Ask fellow campers about "Victoria Springs State Park" and nearby attractions. Park is a shady and the sites are close together. We stayed on a Sunday so there where just a few campers there so had plenty to choose from. Would be very tight on a holiday. Located on a pond so lots of bugs. Nice and shady though and the electricity worked. Nice park. Charge is $19.00 for non residents plus an $8.00 non resident tag. Ranger comes in morning to collect. Dump station. We camped at Victoria Springs State Park in a Motorhome. We were looking for a place to stay in the general area to break up a long drive. We're self-contained and don't use the facilities. We stayed midweek in April. This is a nice small campground. There is a $8 parking charge for non-residents and electric sites are $15. Water is available throughout the park and there's a dump station near the entrance. Most of the sites were relatively flat and all different sizes. Most had at least some shade. There's no wifi. There's a usable ATT signal. There's a usable Verizon signal with a booster. The staff was friendly and helpful. We occasionally heard a faint train whistle in the distance. Very quiet stay. We camped at Victoria Springs State Park in a Motorhome. We enjoyed our stay of two weeks. Park allowed us to hook up to water as long as we supplied a split or y fitting so others could use. Very nice management and well maintained park. Not a lot to do other than relax but that's OK with us. We camped at Victoria Springs State Park in a Fifth Wheel. Beautiful small state park with limited facilities. Water is available at only a few sites. 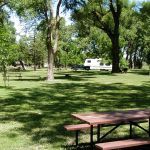 The spacious grass camping sites are very well maintained and restrooms are clean. Electric hookups good. The park manager and ranger are great and make you feel welcome. They could not have been more helpful. A little out of the way but worth the drive. We will stay here again when in the area. 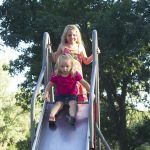 Note: Budget cuts in Nebraska could close this park - hope not because it is a gem. We camped at Victoria Springs State Park in a Motorhome. We stayed in early October and the sites were open but the bathrooms were closed except for a pit toilet at the end of the campground. We were the only ones in the campground and it was a nice quiet stay. We camped at Victoria Springs State Park in a Motorhome. Rangers went above and beyond to insure our happiness with the park. 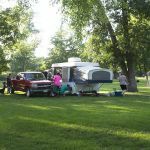 It is a little off the beaten path and is a basic nice and clean state camping park. The water is not at each site but we were escorted to a site that did have electric and water. Lots of beautiful shade trees and very peaceful - we were the only campers in the park. Restroom and shower were directly across from our RV. We would camp there again if we were passing near the area. Don't expect much but a nice grassy spot to camp - but worth it if you're in the area (about 6 miles out of town). We camped at Victoria Springs State Park in a Fifth Wheel. This was the prettiest park I have been to. The campground is amongst corn fields! Wake up to the sun coming up through the corn, a tractor puttering in the distance and the cows mooing. The area is all grass except the road you drive on. There are large shade trees all over the camp. The man that runs the state campground was very nice and helpful. I can't wait to go back. We camped at Victoria Springs State Park in a Travel Trailer. We found this campground to be excellent. A very attractive setting, mostly level grassy sites and lots of huge old trees. It is quiet. There are a couple of farm roads adjacent to the campground with very little traffic. Has a very friendly and helpful caretaker. Price included a NE State Park fee. No TV reception for us. We camped at Victoria Springs State Park in a Travel Trailer. Small, rural state campground. Only power hookups. Water nearby and dump station at exit area. 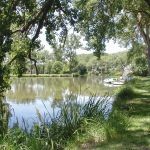 Lots of mature trees and a couple of small lakes with rural Nebraska wildlife, and a few playgrounds and couple of paddle boats for rent ($$$). Three cabins and caretaker on site. Park is located at intersection of two highways so there is an amount of day noise. We stayed off season so it seemed very secluded. We camped at Victoria Springs State Park in a Motorhome. Lots of big cottonwoods for shade. We camped at Victoria Springs State Park in a Fifth Wheel. Are you affiliated with Victoria Springs State Park ?